Merry Christmas and a Happy New Year. 1902; Congregational Church; Rev. & Mrs. R. M. Jones (Welsh Pastor) and daughter Gladys. Here 1891-1897; Edna K. Bickner; Oswego, Oregon; 528 2nd St, [crossed out]: 1st. & B Ave. PO Box 745. Description Scanned as B & W, mounted on cardboard, same as 216b. (corner of 4th & D, land later donated to City for use as a library.) Written above the altar: I am the way. Transcription Merry Christmas and a Happy New Year. 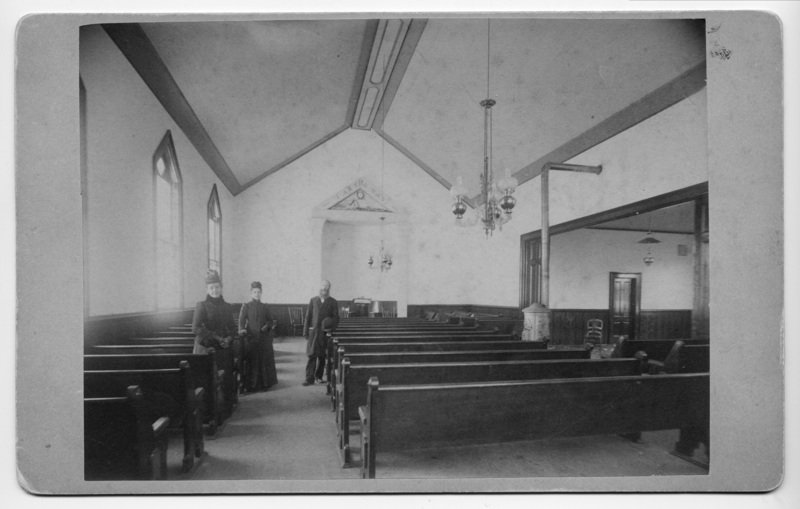 1902; Congregational Church; Rev. & Mrs. R. M. Jones (Welsh Pastor) and daughter Gladys. Here 1891-1897; Edna K. Bickner; Oswego, Oregon; 528 2nd St, [crossed out]: 1st. & B Ave. PO Box 745.